Pencil eye brush with compact bristles for precise shades. 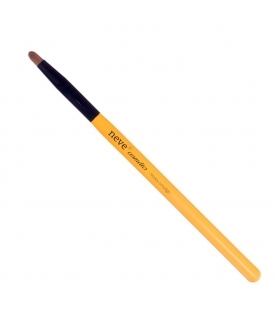 Pencil eye brush with very compact bristles, perfect to create controlled blended shades and light points. The thick and dense synthetic bristles make this brush the perfect tool to blend precisely pencils and eyeliners, the small seized and rounded shape helps to apply concealers to hide even the smallest imperfection. Yellow varnished wooden handle with a shiny finish, shiny black, polished metal ferrule, dual-colour bristles made from cruelty-free synthetic fibre. Uses: eye shadows, concealers, pencils. Max. brush lenght: 16,90 cm. Max. hair lenght: 0,75 cm. Max. hair width at the base: 0,40 cm.